O Precious Blood of Jesus, infinite price of sinful man's redemption, both drink and laver of our souls, Thou who dost plead continually the cause of man before the throne of infinite mercy; from the depths of my heart, I adore Thee, and so far as I am able, I would requite Thee for the insults and outrages which Thou dost continually receive from human beings, and especially from those who rashly dare to blaspheme Thee. Who would not bless this Blood of infinite value? Who doth not feel within himself the fire of the love of Jesus who shed it all for us? What would be my fate, had I not been redeemed by this Divine Blood? 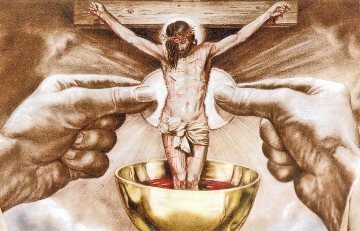 Who hath drawn it from the veins of my Savior, even to the last drop? Ah, this surely was the work of love. O infinite love, which has given us this saving balm! O balm beyond all price, welling up from the fountain of infinite love, grant that every heart and every tongue may be enabled to praise Thee, magnify Thee and give Thee thanks both now and for evermore.